Architecture is both the process and the product of planning, designing and constructing ﻿﻿buildings and other physical structures. 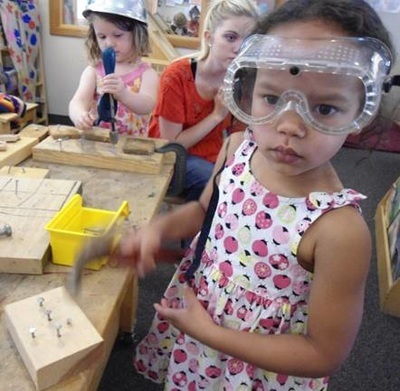 'knowing eye" of children; thereby sharpening their perception, increasing their discernment and allowing children to discover the power of their own learning. Since architecture is a spatial form of art, it is crucial to study it three-dimensionally, involving all the senses. Architecture utilizes a wide range of methods but emphasizes 3D working methods which have proved to be very effective in learning to understand the built environment. 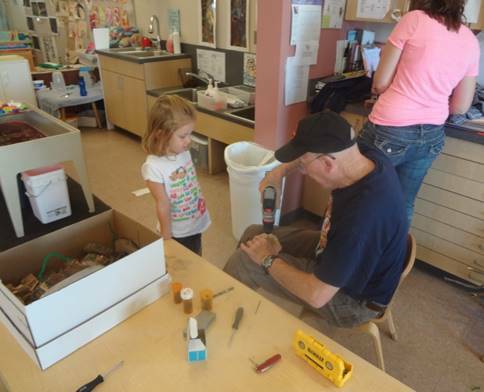 By building miniature models and 1:1 scale, children can make discoveries by themselves instead of being given answers by adults. 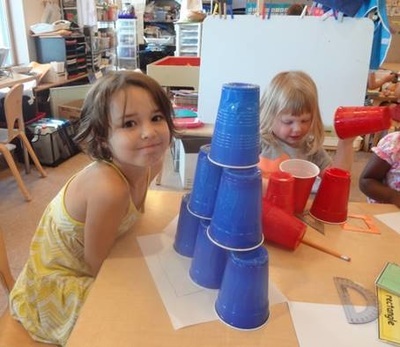 Children are encouraged to use all their senses in experiencing architecture. The human scale and the role of the body in experiencing the physical world form a basis for teaching. The interplay of imagination and intelligence, theory and experimentation are encouraged in project work. 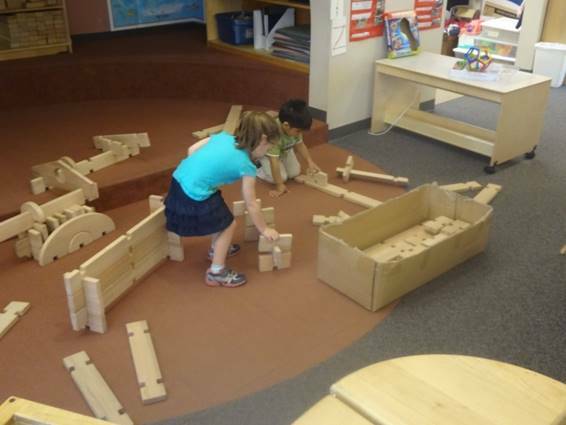 Learning occurs through play and carefully planned project work. 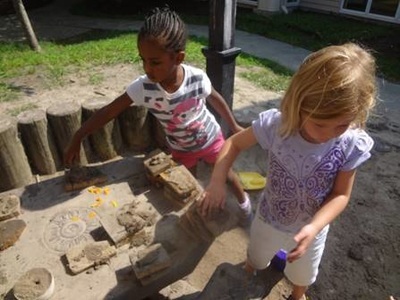 Play is the means by which children explore the world and learn naturally. 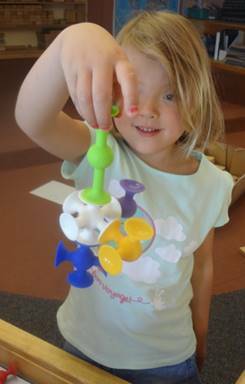 A playful approach enables children to use their inborn imagination and to utilize their natural spontaneity. This contributes to the development of creativity and spatial thought processes. Experiencing success is a crucial element in all learning. Succeeding encourages one to explore the subject further. 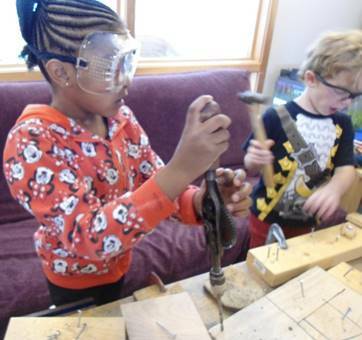 -Provides hands on learning. 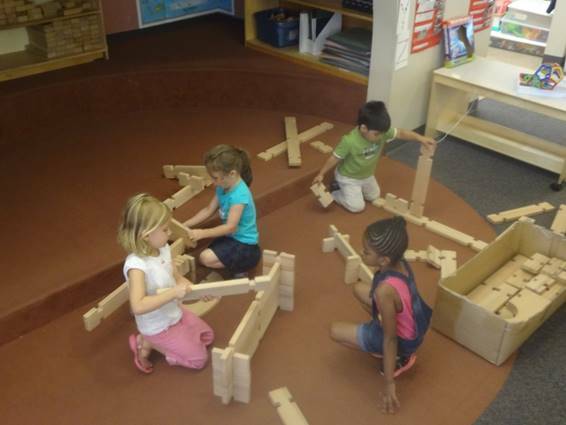 The children discover that architects create plans for others while building structures with blocks. 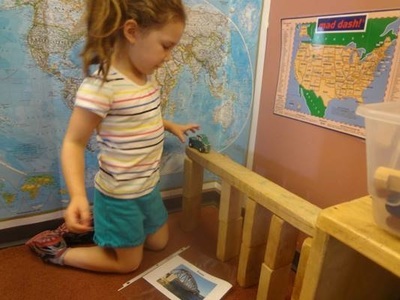 Children find that they solve many similar problems that architects solve in their work. -Communicate about past events and anticipate what comes next during familiar routines and experiences. -With modeling and support remember and use information for a variety of purposes. -Recreate complex ideas, events/situations with personal adaptations. -Demonstrate understanding that symbols carry meaning and use symbols to represent thinking. 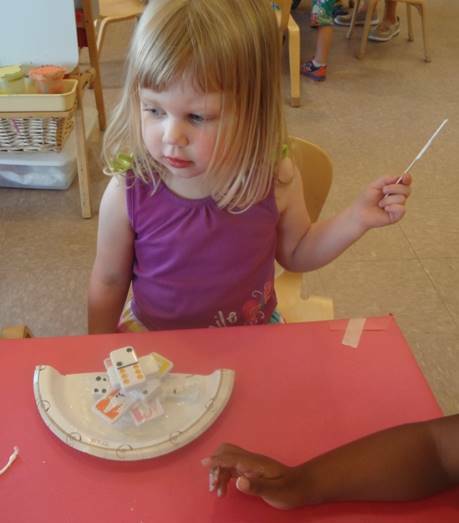 -Participate cooperatively in complex pretend play, involving assigned roles and an overall plan. -Demonstrate ability to solve everyday problems based upon past experience. -Solve problems by planning and carrying out a sequence of actions. -Seek more than one solution to a question, problem or task. -Count to 20 by ones with increasing accuracy. 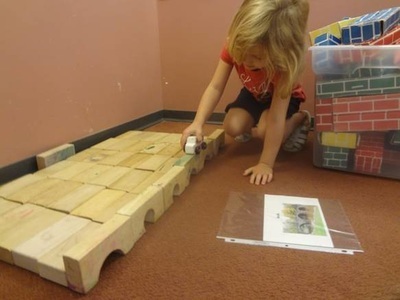 -Demonstrate one to one correspondence when counting objects up to 10. -Collect data by categories to answer simple questions. -Measure length and volume using non-standard or standard measurement tools. -Create shapes during play by building, drawing, etc. -Combine simple shapes to form larger shapes. -Sort and classify objects by one or more attributes. -Count to solve simple addition and subtraction problems with totals smaller than 8, using concrete objects. -Record observations using words, pictures, charts, graphs, etc. -Describe, compare, sort, classify, and order. -With modeling and support, explore the properties of objects and materials. -With modeling and support, explore the position and motion of objects. -With modeling and support, print letters of own name and other meaningful words with mock letters and some actual letters. -With modeling and support, use words acquired through conversations and shared reading. -Develop, initiate and carry out simple plans to obtain a goal. -Use creative and flexible thinking to solve problems. -Use imagination and creativity to interact with objects and materials. -Focus on an activity with deliberate concentration despite distractions. -Carry out tasks, activities, projects or experiences from beginning to end. -Show confidence in own abilities and accomplish routine and familiar tasks independently. WHAT IS ARCHITECTURE? WHAT DO YOU KNOW ABOUT BUILDINGS? During the beginning of our architecture investigation, the children refined their fine motor skills by cutting out pictures of structures from magazines. The children drew on their past experiences and made a representational drawing of what a building looked like to them and gave a definition of architecture/building design. While looking through pictures of famous buildings, the children discussed similarities and differences of the aesthetics of the structures. During group time the children discussed the people who are involved in building structures. They also compared and contrasted the job of a construction worker versus an architect. 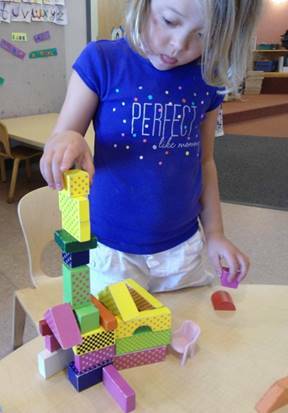 The children further investigated the purpose of structures by constructing their own structures with blocks and then adding the appropriate doll furniture items to add purpose. Using a model they refined their letter formation skills by making a list of different types of buildings using a model. The children also chose a magazine clipping of a building and wrote the purpose of the building. 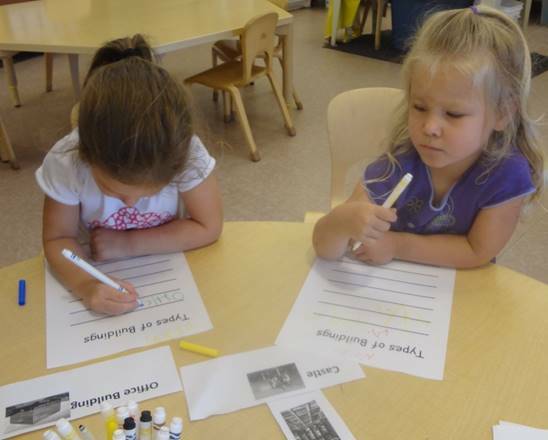 Through this experience the children were able to demonstrate their ability to cluster letters to make words. 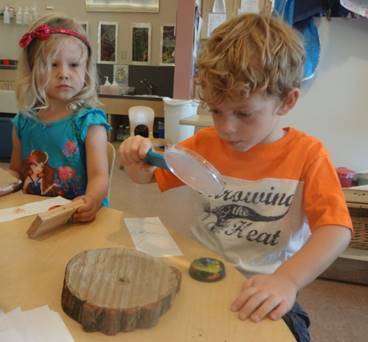 The children studied architecture further by using tools such as magnifying glasses and creating rubbings to explore materials used to build. They used a tally system to track the materials used to build the Bombeck Center. 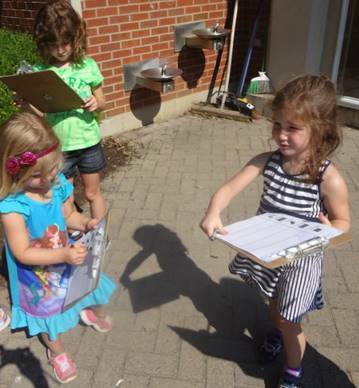 Through this experience the children demonstrated their ability to count by ones and record data/observations. 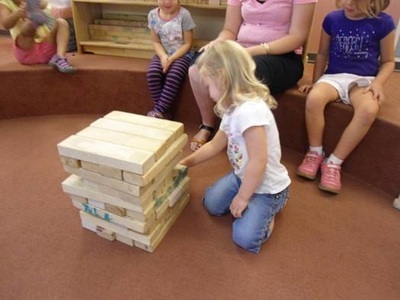 The children also worked together to build a Jenga tower. 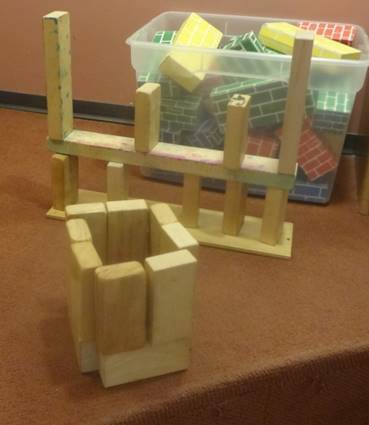 They removed blocks one at a time trying not to knock over the tower. 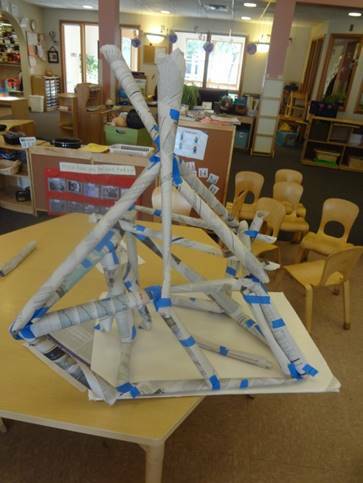 During this experience the children discussed the structural design of the tower. 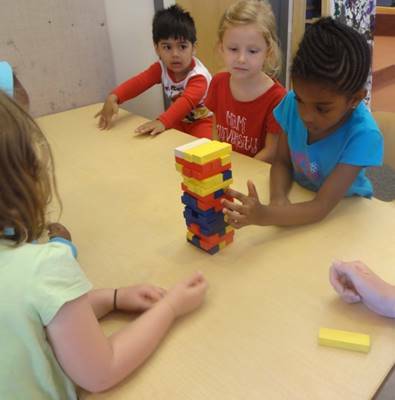 The children discovered that each row of blocks must go a different direction to make a strong tower. They found that removing a block from the middle was a safe move, but them it made it more difficult later because the building could not stand on one block that was on either end. The children began investigating blueprints and planning a design. They discussed their observations of blueprints and traced blueprints. Through this experience the children were able to demonstrate their ability to use a three finger grasp and spatial thinking skills to understand that a blueprint represents an actual place. They used architectural tools to create a plan for a structure. 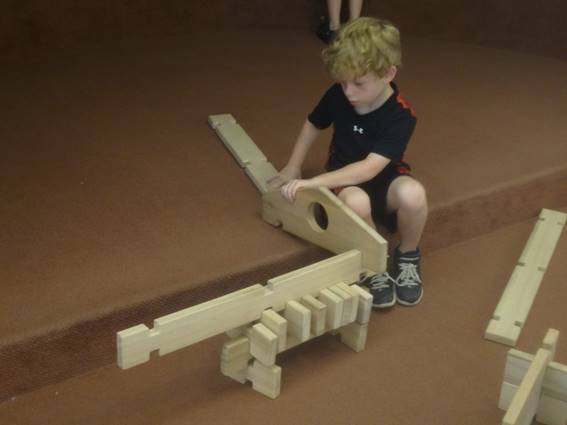 They used blocks with notches in them to follow through with their plan and construct the structure. 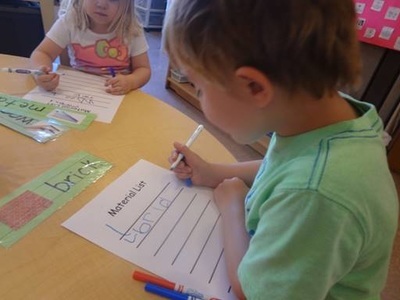 During a writing experience, the children practiced forming letters by making a list of material words and discussed the materials used to build structures. 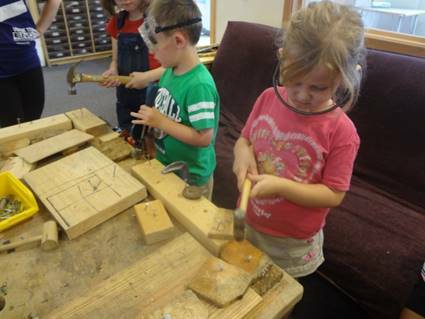 The children experienced building materials by using building tools and appropriate materials to make creations. 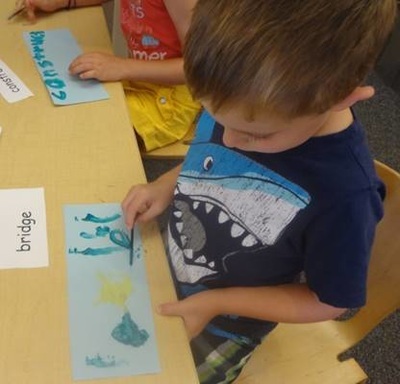 Through this experience the children demonstrated their ability to make precise movements with their fingers and wrists and extended their investigation by using tools. They played a game of Jenga to further investigate structural design. Through this experience the children had to create and follow rules as a group. 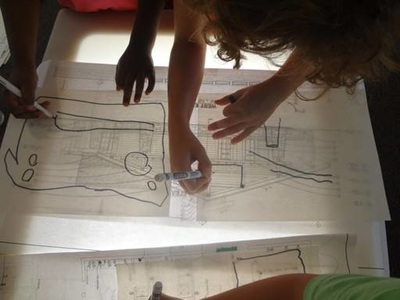 The children also created a blueprint or plan with architectural tools and pencils. 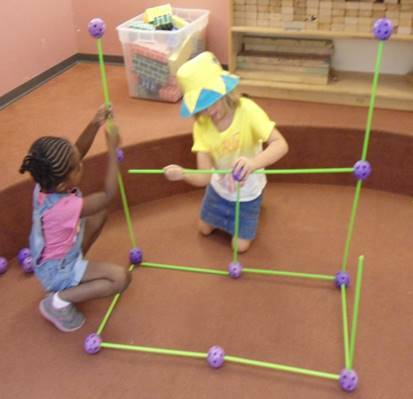 Then they used small blocks to create a model of their structure. 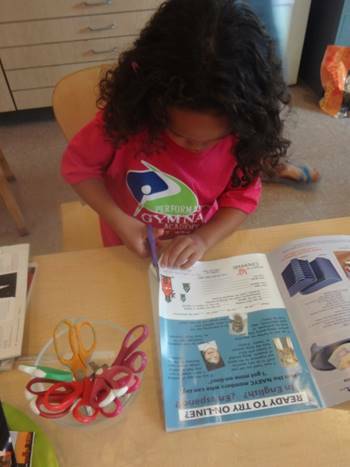 The children further investigated purpose of design by constructing buildings and adding Barbie doll accessories, such as small furniture. 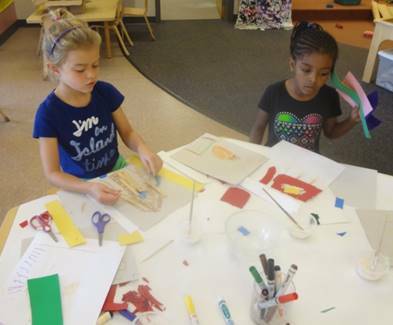 Through this experience the children were able to demonstrate their ability to use imagination to make three dimensional work. They also played Jenga using large blocks in the block area. They found that the tower needed four blocks a row instead of three which made it easier for them to remove more blocks before the tower fell. 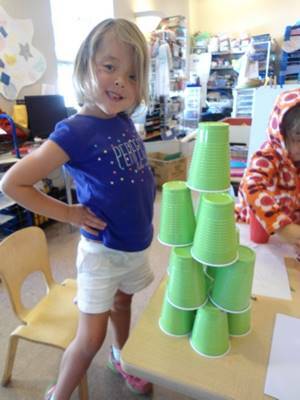 While investigating, planning and creating structures, the children made a blueprint for a structure made of cups. 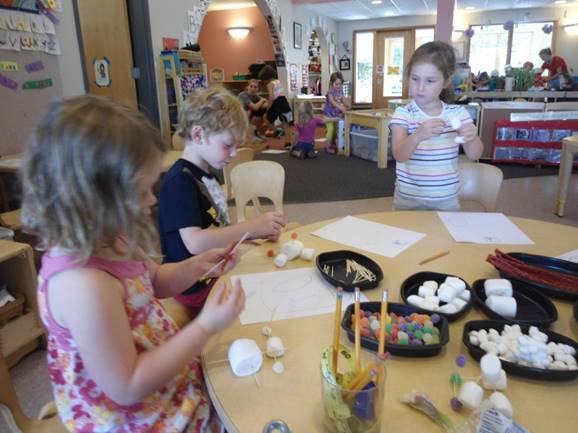 During our architect investigation, the children planned and created structures with various sized marshmallows, gum drops, tooth picks, and Twizzlers. 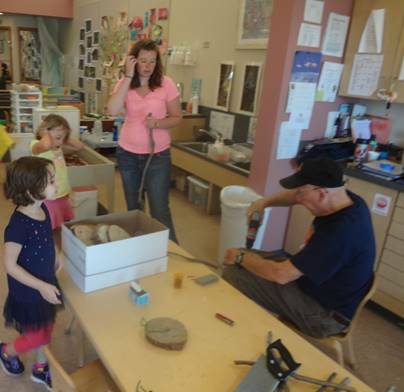 Through this experience the children demonstrated their ability to use imagination and creativity in interactions with materials and objects. They also discovered how to make building materials stick together and how to build a strong or tall building. 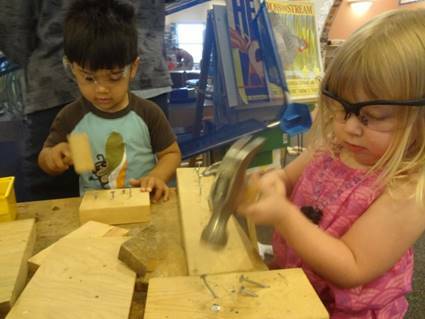 They also explored building materials and tools to extend their investigation at the work bench. 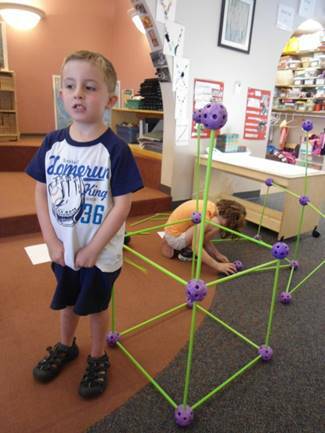 The children drew a blueprint for a straw structure and constructed it with building straws. 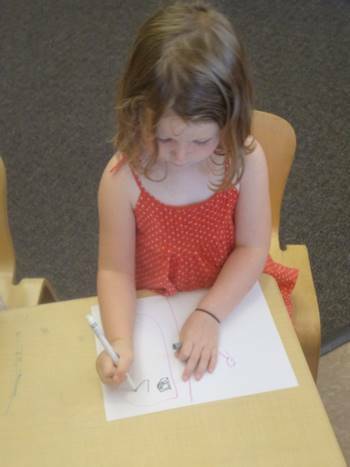 The children demonstrated their ability to initiate and carry out plans to complete a task. 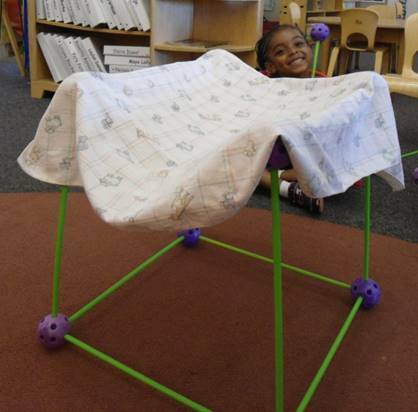 In groups the children used straws and fabric to build structures. 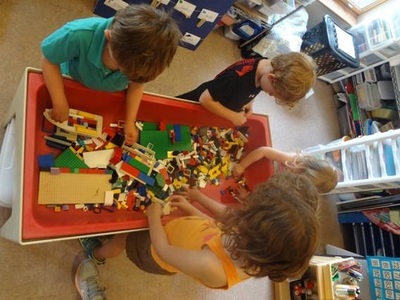 Through this experience the children had the opportunity to use their imaginations with materials and use appropriate interactions with peers to complete a task. 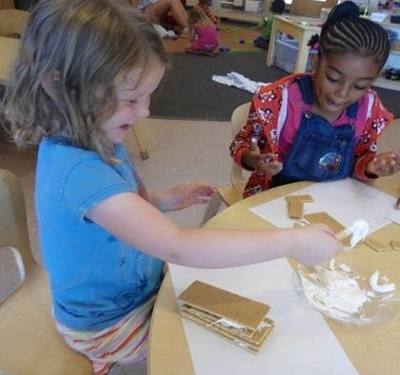 The children used marshmallow fluff as mortar to build structures with graham crackers. They discovered that mortar helps holds materials together so they do not fall down. 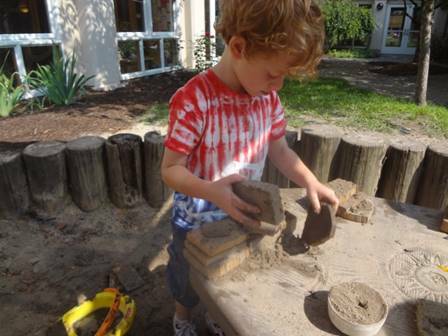 The children also used water and sand to make mortar for wooden blocks to create a standing wall. They found that if they offset the bricks, it made a stronger wall. 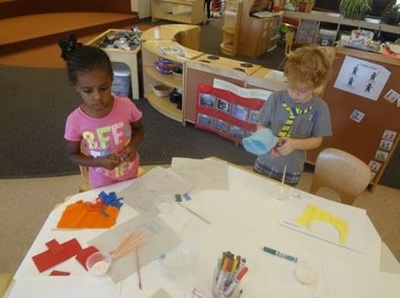 The children had an opportunity to refine their fine motor skills by rolling up paper into tubes and taping them together. As a class the children put the tubes together to make a structure demonstrating their ability to communicate and negotiate effectively with peers. They also worked in teams to choose a purpose for a structure and to create a plan for that structure. Through this experience the children had an opportunity to develop a simple plan to obtain a goal while also working cooperatively with peers. The children also practiced building a wall by making mortar with sand and water and using the mixture to make a structurally sound wall. 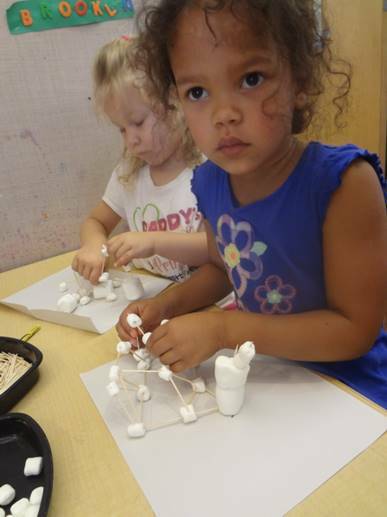 During our architect investigation, the children constructed structures with various sized marshmallows, tooth picks, and Twizzlers. 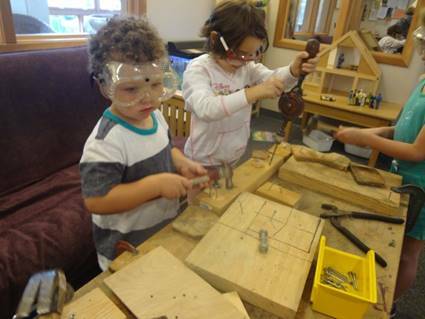 Through this experience the children demonstrated their ability to use imagination and creativity in interactions with materials and objects. They focused on how to build a strong or tall building and discovered that a triangle shape is the strongest way to build up. 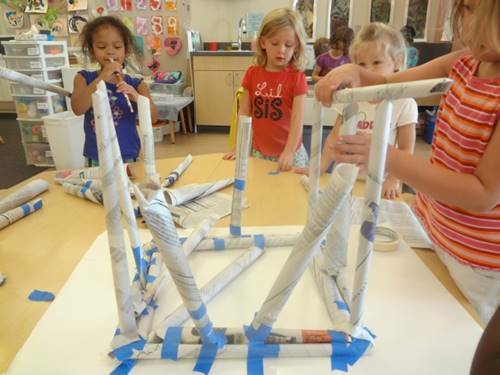 The children had an opportunity to refine their fine motor skills by rolling up paper into tubes and taping them together, focusing how to make their structure stronger. As a class the children demonstrated their ability to communicate and negotiate effectively with peers by putting the tubes together. The children also used marshmallow fluff as mortar to build walls with dominos. They discovered that mortar helps holds materials together so they do not fall down. They found that if they offset the bricks, it makes a stronger wall. 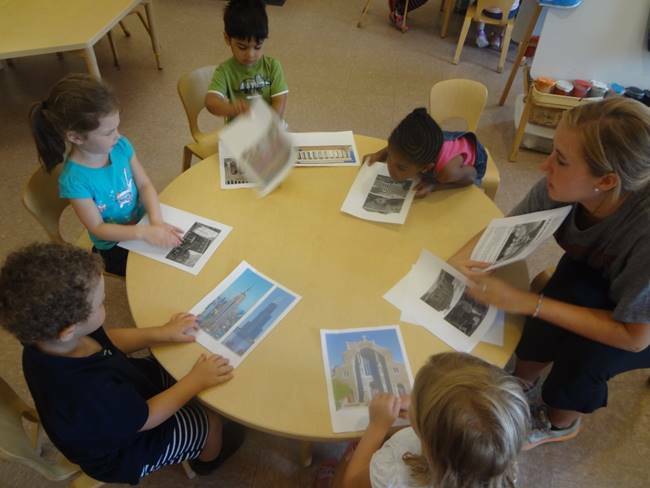 The children went on a scavenger hunt to find architectural features in the Bombeck Center and magazine clippings. 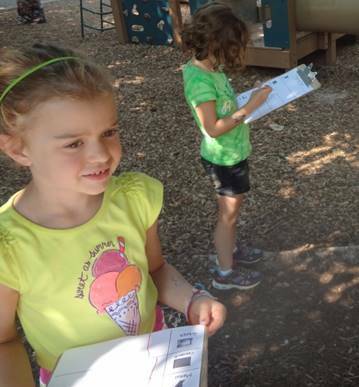 They recorded their findings of structures like pillars, columns, pediments, and domes using a tally system. 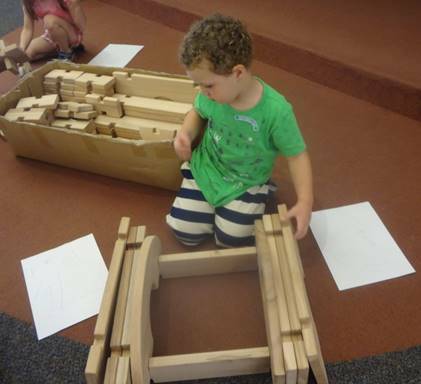 They also looked at familiar buildings and replicated those using blocks. The children worked in groups to gather their materials and to construct their buildings with recycled materials. They demonstrated the ability to negotiate with friends to complete a task and follow through with a simple plan to reach a goal. The children were introduced to tree houses through research found on the iPad. They were able to watch the steps of building tree houses and view several types of tree houses. The children followed through with their plan to design a structure. They used their materials that they gathered to build their structure. 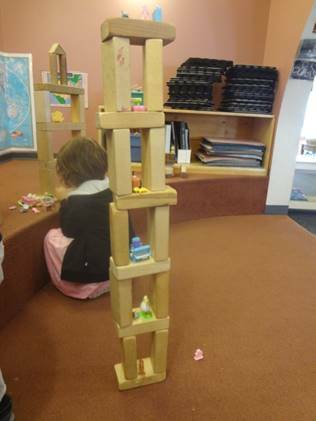 The children were able to carry out their goal from beginning to end by building the structure based on their model that they drew just days before. Working together in groups was a key component of their session which required them to communicate and compromise with their peers. They also drew a plan with architectural tools and made a model of their plan with Lincoln Logs. They were able to manipulate the position of the logs in order to build houses and walls. 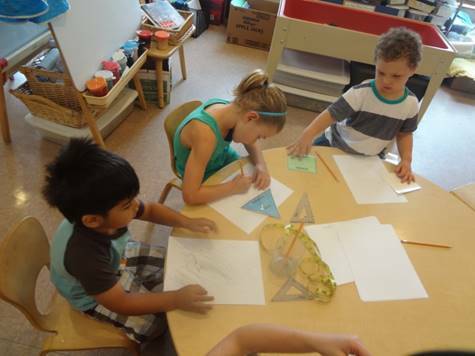 The children worked in teams to choose a type of building they wanted to draw and then created it with blocks. Through this experience the children developed a simple plan and worked cooperatively to carry out the plans. They also worked on an architectural design for a tree house they liked and wanted to build. Using the iPad, they viewed pictures of different tree houses and decided which they wanted to draw. The children had an opportunity to go outside and discuss what type of playground equipment they would like to design and build for their playground. Through this experience the children shared their ideas with their peers using language and drawings. The children began using their plans to build a model of a tree house. They used a cross section of a tree and a stick connected by a screw as a tree. Through this experience the children were able to demonstrate their ability to make a choice and understand that rules help maintain safety and fairness. They also used various sized Popsicle sticks and materials to make a model of their structure for the green space on the playground. They demonstrated the ability to use imagination and creativity in interactions with materials. The children examined various building materials by measuring them with non-standard units of measure. 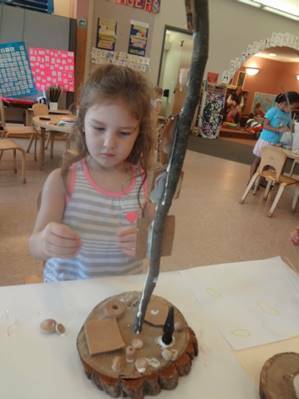 The children used their tree house blueprints to gather materials and glue them on their model tree to make a tree house. 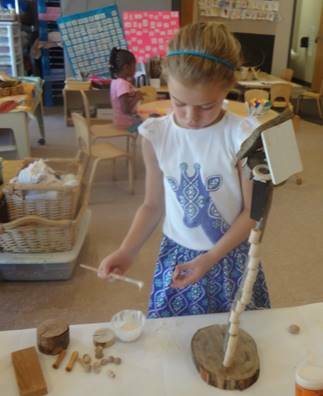 Through this experience the children were able to demonstrate their ability to use creativity and imagination with materials and problem solving skills when manipulating materials and attaching them to their tree. 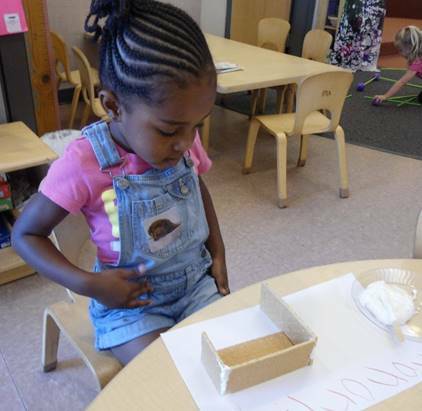 They also practiced forming letters and discussed new vocabulary words by making a list of architectural features using a model with a picture. 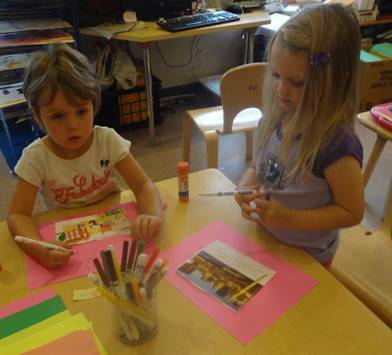 In the block area the children used pictures of familiar buildings and used various types of blocks to build models of buildings.